Some of our members support the David Sheldrick Wildlife Trust. We would like to introduce this institution to our other members and aks them to consider supporting this wonderful initiative. Founded in 1977 by Dr. Dame Daphne Sheldrick D.B.E, in honour of the memory of her late husband, famous naturalist and founding Warden of Tsavo East National Park, David Leslie William Sheldrick MBE, the DSWT claims a rich and deeply rooted family history in wildlife and conservation. At the heart of the DSWT’s conservation activities is the Orphans’ Project, which has achieved world-wide acclaim through its hugely successful elephant and rhino rescue and rehabilitation program. The Orphans’ Project exists to offer hope for the future of Kenya’s threatened elephant and rhino populations as they struggle against the threat of poaching for their ivory and horn, and the loss of habitat due to human population pressures and conflict, deforestation and drought. To date the David Sheldrick Wildlife Trust has successfully hand-raised over 150 infant elephants and has accomplished its long-term conservation priority by effectively reintegrating orphans back into the wild herds of Tsavo, claiming many healthy wild-born calves from former-orphaned elephants raised in our care. 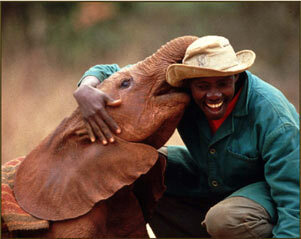 The DSWT has remained true to its principles and ideals, remaining a sustainable and flexible organization. Guided by experienced and dedicated Trustees and assisted by an Advisory Committee of proactive naturalists with a lifetime of wildlife and environmental experience, the Trust takes effective action and achieves long-lasting results.